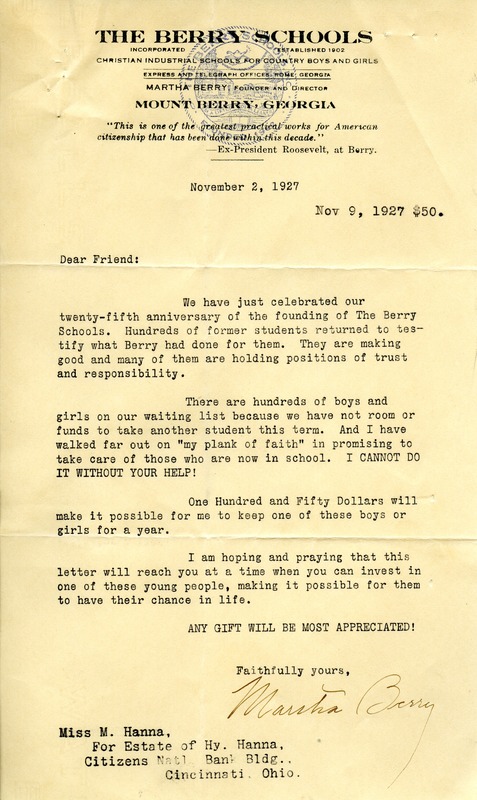 Miss M. Hanna has received one of Martha Berry's blanket letters announcing the Schools' recent celebration of its twenty-fifth anniversary and pleading for donations to allow more students to be accepted into The Berry Schools. Miss M. Hanna, for the estate of Hy. Hanna, sends a donation of $50 in response. Miss M. Hanna, “Letter to Miss M. Hanna from Martha Berry.” Martha Berry Digital Archive. Eds. Schlitz, Stephanie A., Lindsey Purvis, et al. Mount Berry: Berry College, 2012. accessed April 24, 2019, https://mbda.berry.edu/items/show/6374.